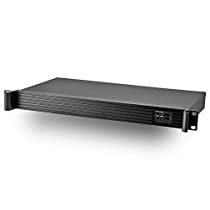 The RS-1UACT1900 features a shallow-depth 1U Rackmount enclosure with an Intel Celeron J1900 Quad Core processor, 4GB DDR3 memory (upgradable to 8GB) and 120GB 2.5" solid state drive preinstalled. With an low-power footprint, this 1U rackmount is perfect fit for embedded server applications. The system features 2 Gigabit Ethernet ports and 4 serial RS232 ports.